….well at least Kanye West. First off, I thought Evil Knievel was dead, but I tried to contact him via my Ouija board and when he didn’t answer I assumed he was alive….he is. Not only he is alive, but he’s also realllly slow. Evil is suing Kanye West for his “Touch the Sky” video (which I think came out like a year ago) because Evil feels that Kanye ripped off his jumpsuit and death defying feats. Um, can you say “death defying feats” if you’re not Wile E. Coyote? Anyway, Evil is pissed and has filed suit against Kanye and Roc-A-Fella Records. Evil feels that the music video damages his reputation and earning power due to vulgar and offensive sexual images, language, conduct. Where to begin? Where to begin? Hey Evil Knievel, up until about 15 minutes ago I thought you were already dead. I would think that most people think that as well. I think that being thought of as “dead” will probably damage your earning power more than a Kanye West video that hasn’t been played on MTV in about 9 months (not that MTV plays videos, but I won’t go there). Uh, yeah. No, no. Kanye didn’t disgrace you. Oh, and setting an example for your children? Yeah, I wouldn’t want to set the example for my children of trying to jump like 400 buses over a pit of fire on my motorcycle. 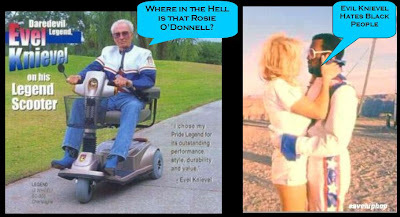 If you really want to make a comeback try something really crazy like trying to jump your “Lark” scooter over Rosie O’Donnell…..that’s the same thing as a motorcycle and 400 buses, no? At this time there has been no comment from Kanye West or his lawyers, but I think if you are really really really really quiet you can actually hear them laughing all the way from here. **Breaking News*** As a side note I did my little schtick on Evil and his “Lark” scooter and then I searched for a picture of him. What did I find? A picture of him on a Lark scooter! Seriously, I amaze myself.